Hello everyone. I’m here yet again to show you my latest piece of work. This time it is a city scene image of Tokyo. I started this image before the terrible natural disasters that hit Japan, So I feel this image for me has taken on more of an importance. I have also decided when I sell the image I am also going to donate a lot of the funds to the Red Cross Japan tsunami aid. On a happier note, I hope this image represents the real Japan & Tokyo we all know, colourful, vibrant, full of life and happiness!. (For people who aren’t aware of many Japanese Anime cartoons, the floating animal balloon in the air is of ‘Tottoro’, the famous animal from the hit animation ‘My neighbour Tottoro’, from the maker’s of Spirited away!). This image has been a long time coming, about 3 weeks, due to other work commitments etc, but I am really happy with the outcome. 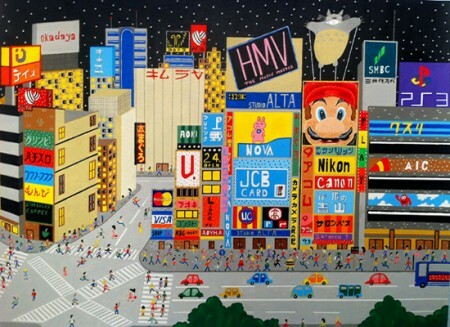 I absolutely love painting busy city images with lots of people and advertising boards. I hope you all like the image, and once again, any comments are encouraged!